As 2020 approaches, so does the next presidential election. More women are beginning to raise their voices and starting to run for office. With 125 women being elected during the 2018 midterms into the Senate, the House of Representatives and governorship, many feel it is time for a woman to hold the position of President of the United States. Women in the past couple of years have started movements to create a safe platform to voice themselves on issues such as reproductive rights, sexual harassment, and gender equality. For example, the Women’s March was created in 2016 by women for people who feared that President Donald Trump and his administration would not give attention to women’s issues. There have been three Women’s Marches since then, focusing on increasing voter turnout and electing more women in charge of policies. Senior Skylar McVicar participated in the march this past January and thought that it was productive in promoting women’s rights and uniting women for a purpose. “I think that the Women’s March is effective because it allows people with a common goal and interest to come together and lift each other up instead of feeling like you’re alone in your cause,” McVicar said. 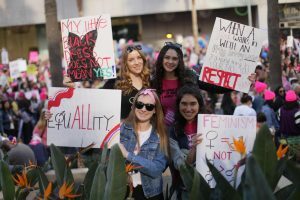 Junior Riley Murakawa believes that the Women’s March is a great way for men and women to express their beliefs and demonstrate the direction they want this country to go in. “I do think that the March is very inspiring, but do not think it is the only reason that led to more women taking office. It definitely created a safe platform for women to express their viewpoints,” Murakawa said. Many women already present in office, such as Sen. Kamala Harris of California and Sen. Elizabeth Warren, have announced their decision to run for President. Junior Caroline Pack is inspired that qualified women have stepped up to represent the American people, and even more inspired that one of her representatives is running for president. “It is amazing that women, even after having the Trump administration, are not discouraged to run for President. It is empowering that [Senator Kamala Harris] is running for president, I know that she has done a lot of work for our community in Los Angeles, especially with the homeless,” Pack said. Senator Harris is running by the slogan “For the People,” which reflects how she values people’s beliefs and rights. US History teacher Christina Varela feels that this slogan is relevant right now, especially since people who are voted in to office work for the citizens, not themselves. “I think what people are feeling is that the people in Washington work for us, and they seem to forget that. They need to represent all Americans, not just a small contingent of people,” Varela said. The Women’s March and rising female candidates not only gave a push towards female empowerment and involvement in politics, but also resulted from the of the 2016 election and emotions that rose from it. “I think it’s a combination of several things that collided at once. I think people’s dissatisfaction with the outcome in 2016, the Women’s March, Me Too, and Time’s Up all collided to a place where women are saying we want a seat at the table,” Varela said.